Thank you to everyone who attended this year’s Empty Bowls Soup Supper. We sold nearly 300 tickets, and both seatings sold out in advance! All total, the event raised $28,000 for our Homeless Prevention Services (HPS) program helps members in our community who are on the brink of homelessness, as well as those who are currently unhoused. Planning is already underway for the 2020 event. Please contact the Development Office at (650) 968-0836, extension 115, if you are interested in being on the event committee. 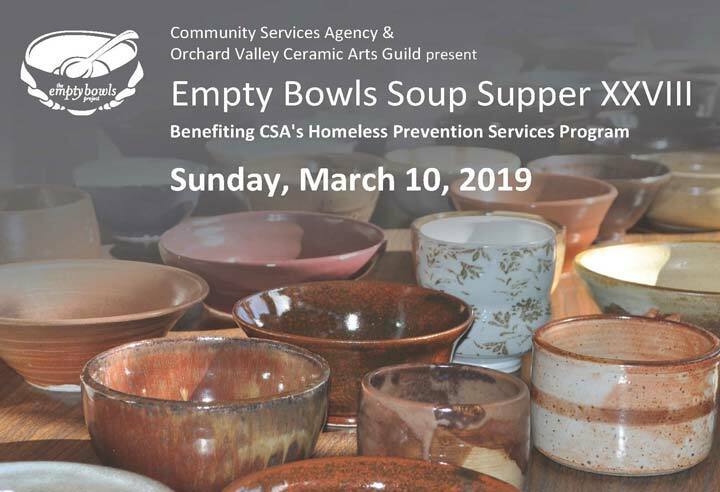 Orchard Valley Ceramic Arts Guild, a talented team of potters who have partnered with CSA on our Empty Bowls Soup Supper event for the past 27 years … and counting!